Why Are Sequels So Bad? No, no I get it. Not all sequels are bad but you know there’s one out there that makes your blood boil. I’d like to find one person who has enjoyed EVERY sequel, even every single Saw or Paranormal Activity (but that’s a different post entirely so let’s move on). 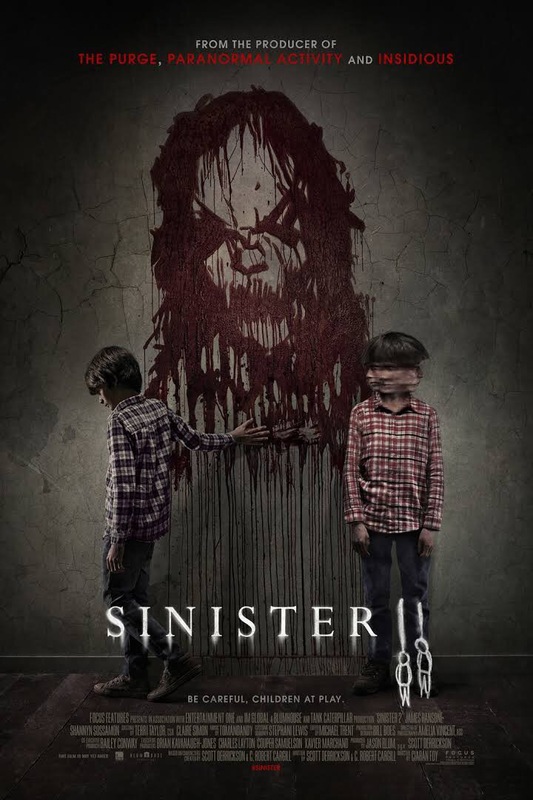 In case you can’t tell by the giant poster today we are talking about Sinister 2. Sinister 1 was a brilliant horror movie that included a lot of old, normal horror tropes but with a fresh new idea, basically films with the film. The character Ellison is writing a book on murders and moves into the murder house with his family to find out more. Within this house he stumbles upon a box of old film reels that show a horrifying film of family’s being murdered. It turns out that if you see the demon known as Mr Boogie that is seen in the home movies he will come after your own family. The twist is that Mr Boogie takes one of your children and that child is the one that kills their family. Gruesome right? So onto Sinister 2. Sinister 2 has basically the same premise and follows on after what has happened in Sinister 1. A new family move into the murder house and one of the children finds the tapes. Yes, instead of it being from an adult’s perspective this time it’s from a child’s. This child has to watch all the awful tapes and murders as they take away the ‘bad dreams’ he has at night. It turns out that the boy that Mr Boogie had chosen to watch the tapes with the murderous children isn’t actually going to be the one to do the killing. His brother however, due to his violent tendencies and anger is the chosen one and takes on the terrible task of killing his family. In the end the boy takes the camera and the film to film the deed. He ties up his mother, father and brother on crucifixes in a corn field and tries to set them alight. Before this can be done the investigator from the first movie that has been overseeing what has been happening stops the boy and ultimately destroys the camera meaning the boy cannot complete the deed and thus is killed by Mr Boogie. Does this seem weird? Because this seems weird to me? Basically the boy ends up being punished and killed just because a camera broke? I found this kind of lame because it just ends. It’s over because of this one thing happening and it doesn’t seem earned. Another thing that annoyed me was that the only person the boy is able to murder is his father who was abusive to the family and the boy deemed ‘the evil child’ in my opinion dies too. Overall this has a happy ending because the mother and the good kid can go on and live their lives and get away from anything that was terrible in their lives before. Is that a cop out? Yes I know people love happy endings but it just seemed so rushed and way too easy. Even the house burns down at the end with the contents of the murderous tapes meaning that no one else can be taken or killed by Mr Boogie. Basically it wraps up all loose ends in a very lazy and quick way. Right at the end the investigator has a radio in his office and it starts saying his name before a final jump scare where Mr Boogie basically jumps out at the camera in the same style he did in the first movie. This leaves a sort of cliffhanger that seems a bit weird when Mr Boogie has been known to only use film cameras within both movies. There’s hints at him using music/radio to be summoned too but that was a flimsy line thrown in to try and justify that ending. In my opinion it was anyway. My issue with this movie is that is too similar to the first and the ending is not worth it. It’s too quick and lame and just doesn’t do the first movie any justice. The use of loud noises when there is a jump scare as well is a total cop out and if the jump scares were actually that good they wouldn’t need the sudden noise to go along with it to be scary. I suggest watching the first movie because it is really interesting and the ending to that is good but maybe give this one a miss. If you have an opinion on Sinister 2 I would love to know it!